My husband and I live in a very festive neighborhood, which is great, because we are very festive people. Since college, we’ve made a big deal out of holidays, decorating to the hilt and, of course, preparing foods to celebrate the day. Halloween is huge in our ‘hood. Last year, I had to run to Publix mid-trick-or-treating to buy more candy. And one of my favorite things to do before the barrage of kids in costumes is make a Halloween feast. Yes, it’s silly. That’s the point! Here are some of my favorite treats. I make these every year for Halloween, because we desperately need some fruit in this mix. To make, quarter 2 or 3 apples. Place quarters in a bowl and squeeze the juice of 1 lemon over top. Mix; this will prevent the apples from browning too much. Now, take a quarter and cut a gap into the side, through the apple skin, to create an opening for the mouth. Make it large enough to fit two rows of teeth. For the teeth: My go-to is slivered almonds, the more jagged and mismatched the better. You can also use shelled sunflower seeds; anything that can pierce easily into the apple’s flesh. Coat the inside of the gap with peanut butter or almond butter, then stab the apple’s flesh with the almond slivers, using 4 or 5 on the top of the gap then repeating on the bottom. Repeat with remaining apple quarters. Even candy corn haters can get behind this treat, which disguises the waxy candy’s flavor by mixing it with lots of other sugary items to create a quick treat. To make it, melt 16 ounces white chocolate chips or white baking chocolate in a microwave-safe bowl. Microwave in 30-second increments until melted. On a long piece of parchment paper, spread 1 cup crushed pretzels, 1 cup chopped chocolate chips (I like dark chocolate) and 1 cup chopped peanuts. Mix them a little, then form into a loose square. Pour white chocolate all over the top, then spread just slightly so some white chocolate touches all of the mixture. Sprinkle ½ cup candy corn on top, pressing candy corn slightly into the still-wet chocolate. Place in freezer for 5 minutes to allow chocolate to harden. This is the Halloween version of pigs in a blanket. To make, you’ll need some refrigerated biscuit dough and some precooked hot dogs or any kind of sausage. I like to use full-sized hot dogs for these. To make, roll one biscuit into the longest, thinnest strip you can, then wrap tightly around one hot dog. Leave a small part at the top open for the mummy’s face. Repeat with remaining dogs and biscuits, then bake in a 350-degree oven for about 15 to 20 minutes, or until biscuit dough is cooked through. The dough should puff up and look like mummy wrappings. Create eyes with little dots of mustard on the open area of the hot dog. Serve with ketchup for a bloody aesthetic. This pasta could not be easier to make, plus it will provide a solid main dish for the evening. Not to mention that thin wiggly angel hair pasta swimming in an orange sauce is on theme for this night. 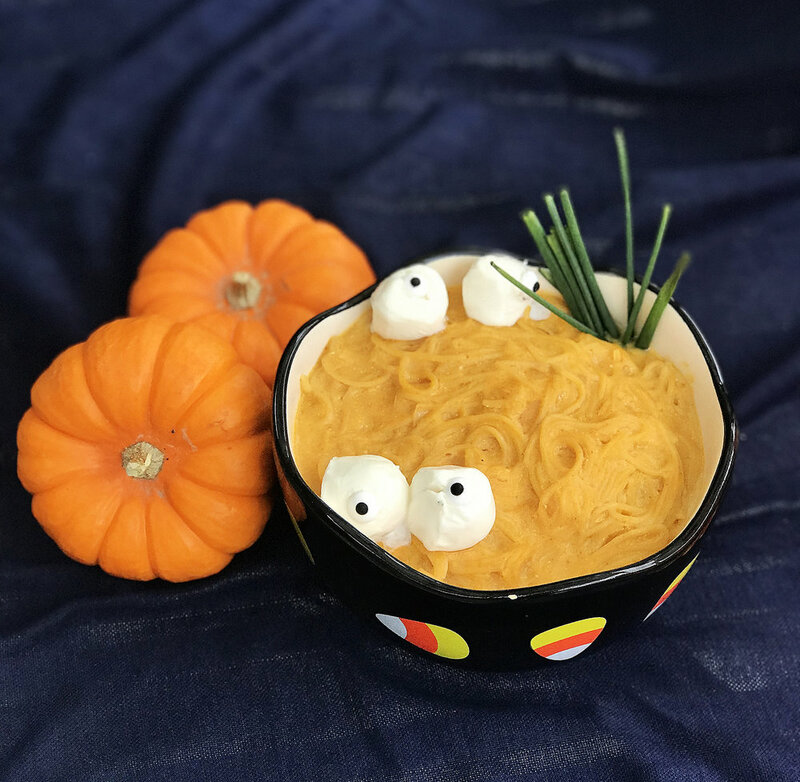 Add the following to a pot: 12 ounces angel hair pasta, 1 cup pumpkin puree, 3 cups chicken or vegetable broth (you could even use water), ½ medium onion finely chopped, 3 cloves minced garlic, a couple tablespoons olive oil, salt and pepper to taste and a pinch of red pepper flakes. Cover pot, bring to a boil and let cook for about 8 minutes. Remove lid, stir in 4 ounces goat cheese and a handful of fresh parsley (optional) and stir well. If soupy, let cook with the lid off for a minute. If dry, add a couple tablespoons water and stir. Serve, preferably with some Cheesy Eyeballs on top. Every celebratory food spread needs some melty Brie cheese, and this one is no exception. Start with an 8-ounce tube of refrigerated crescent rolls, or 2 store-bought pie shells. Place one dough layer on a sheet pan lined with parchment paper, then spread about 1 tablespoon red jam or jelly over the dough. Your choice on the flavor. Place an 8-ounce round of Brie cheese in the center of the dough, then heap a couple more tablespoons jam onto the Brie, spreading it slightly so it starts to drip down the sides. Place second layer of dough on top, pressing lightly to adhere to the bottom layer. Using a sharp knife, carefully cut dough into the shape of a heart. Roll the edges of the dough up slightly to secure. If you don’t have enough dough to make a heart, you can simply roll the edges up without shaping it. Brush with egg wash: 1 egg mixed with 1 tablespoon water. Bake at 350 degrees for about 25 minutes, until crust is golden. Let cool slightly, then cut into it before serving so the red jam can ooze out dramatically. These are adorable, and also a great little snack, the saltiness of the pretzels pairing well with mozzarella cheese. Start with a handful of mozzarella string cheeses. Cut each log of cheese in half horizontally, so you have two stubby cylinders of cheese. Carefully insert a small pretzel stick into one side of the cylinder, and push it about halfway down. Using a pair of kitchen scissors, make 5 or 6 snips into the bottom half of the cheese, creating strands. Wrap a strand of fresh chive around the top of the cheese, where it meets the pretzel, and tie carefully to secure.rnails up.